Hey hey! It's Thursday! Almost done with the week! I don't know about you, but this week went by kinda fast!!! I'm not complaining, I'm ready for the weekend to begin!! Lots of nothing to do!! LOL!! The Saldana Tee is a great pattern because you have SO MANY options with it! It can be sewn a top, knee length, or maxi dress! It have side panels allowing for some fun color blocking, and cute details, like topstitching, the sleeve tacks, and side split! For my dress, I decided to go with the knee-length, without the sleeve tacks. 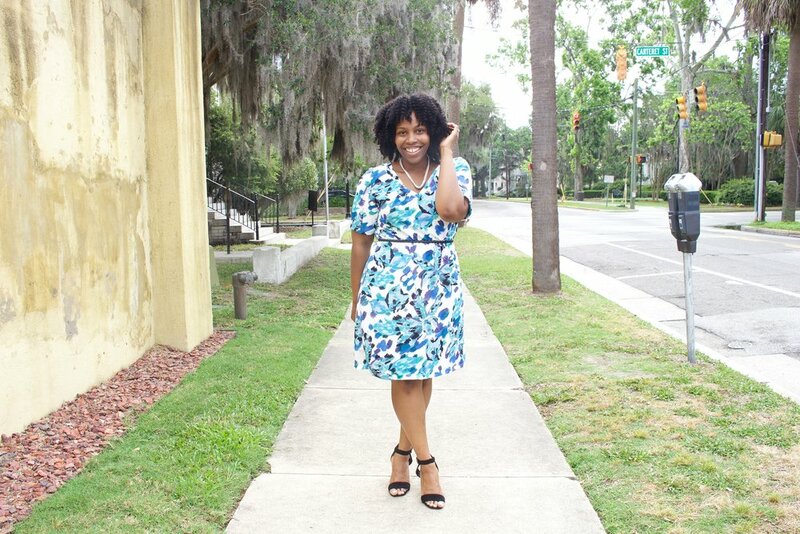 I just wanted a simple but cute dress to throw on with some heels, or sneakers to get me through my daily errands as comfortable as possible! I had no problems sewing this dress, and the instructions were easy to follow with photos of the steps!! I've added this to my 1 hour projects, because it literally took me 1 hour to make!! My fabric is this pretty Liverpool Knit for LaFinch Fabrics!! I can't say enough good things about this store! Beautiful fabrics, amazing prices and the customer service is everything!! I pray you have an awesome day, and make sure you subscribe to my newsletter below! !